Roaming Stamper: Stampin' Up Convention and SWAPS! I've been busy preparing for Stampin' Up! 's 20th birthday convention that is at the end of July. I can't wait to get there with the other 8,000 or so excited Stampin' Up! demonstrators to see the NEW catalog for the first time and all the great samples! A huge part of convention is SWAPPING! I have been sequestered in my stamp studio for over a week working on several swaps I joined. I still have a couple more "organized" swaps to do and then I need to make some cardfronts for general floor swapping. This is a great way to share ideas, information, and for me to learn new techniques and projects to bring back and share with you! Over the next week or two, I will be sharing some of my swaps that I've prepared to take and share with my fellow demonstrators. Here is the first swap I completed. It was for Punch Art ATC's. ATC is short for Artist Trading Cards. These little jewels are roughly the size of a baseball card so you have to pack a lot of punch into a small area (no pun intended). I signed up to do four groups and we made 20 of each one, so I'll come home with 80 Punch Art ATC's! 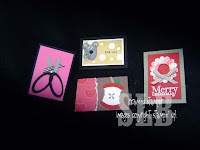 From the left, those are scissors made with Stampin' Up's two oval punches and the word window punch which has been cut to make the blades. A brad is in the center of the blade to represent the screw in scissor blades. I added the ribbon for fun! This was for the "things" category. Upper middle is for the animals category and it's a little mouse. He is made with the large oval (folded over) and 1/2 and 1/4 inch circle punches. His feet are made with the Boho Blossom punch that has been cut. A mouse needs some cheese so I made it using the 1/2 inch and 1/4 inch circle punches. Lower middle is an apple for the food category. It is made with the Round tab punch. The leaf is made from the five petal punch and the stem is hand cut. Right is my wreath made for the holiday's category. It uses the Scallop Circle punch and the 1/2 inch circle punch. It is spiffed up by stamping on it with Mellow Moss and Real Red then covering the whole thing with Versamark and embossing with Iridescent Ice emobossing powder. These were really fun to do and although they were my first ATC's I don't think they'll be my last! Have fun creating your own punch art using Stampin' Up! 's great selection of punches! Check back tomorrow, I'll be posting my Convention Planner I did for a Dream Swap--All the best 3-D projects!